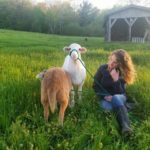 Over the past four years, my grandchildren have raised several orphaned lambs—from the lambs’ weak bleats and bottle feedings day and night to their gamboling through the house in diapers and eventually to their move to a nearby farm. 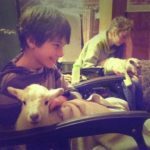 I was struck by my grandchildren’s deep compassion for and dedication to rescuing these vulnerable animals. What strong mutual bonds form between animals and humans! 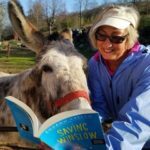 Since our granddaughter may want to write her own story of the lambs, I chose to write about another orphaned animal—a donkey—and immersed myself in donkey books and videos. Oh, those donkeys! I love them. 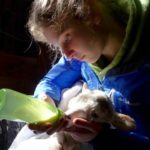 Our granddaughter has gone on to breed and raise her own small flock of Katahdin sheep, a flock that grows in number each year with the births of new lambs. 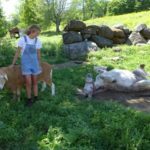 Recently, our granddaughter moved her sheep flock to a farm that could better accommodate their growing numbers. Who else lives at the farm? 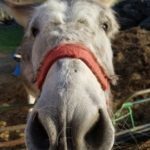 No other animals – except for a donkey named Jonathan. 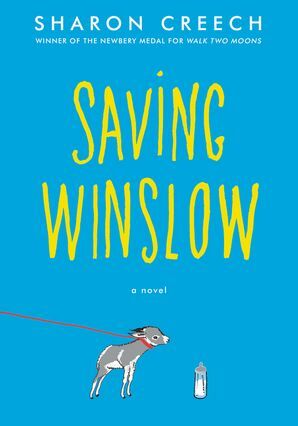 Although he is full-grown, he is a lot like Winslow—funny, gentle, and ridiculously loud.